Flat Tire? Get tire help now! Flat tire? That’s not fun! We are here to help, no matter where you are, on the road, in a parking lot, or even your driveway and you need flat tire help. Calling Buzz Towing at 678-916-9021 for flat tire it doesn’t mean you have to get a tow! Our driver will immediately asses the tire and decide if he can replace your tire right there or he will need to tow your vehicle to a mechanic or tire shop. If you have our phone number saved in your phone there is no need to call someone else.. 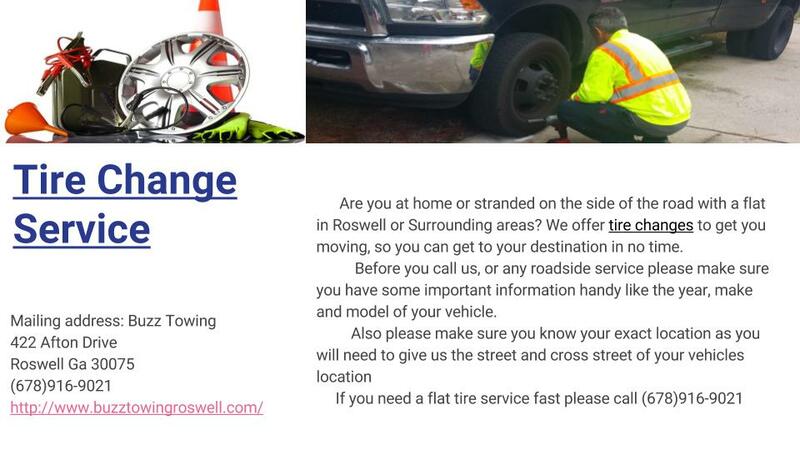 If you have a tire repair service need in Roswell, we will be there in minutes. 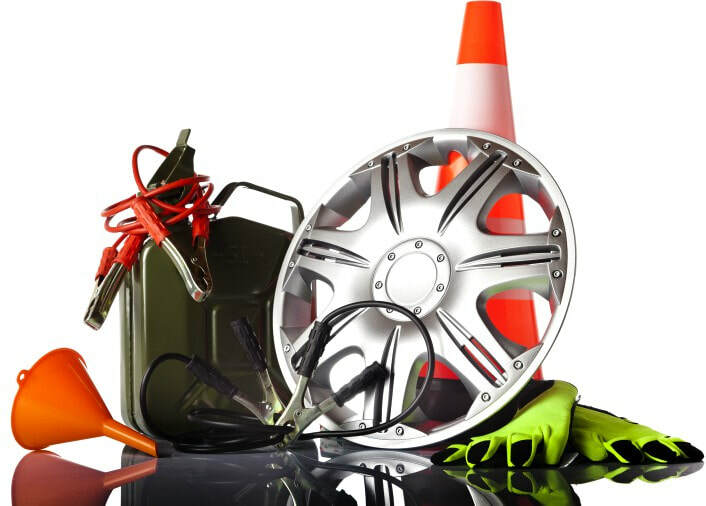 No need to wait hours for a roadside assistance company to be dispatched from tens of miles when we are right here in Roswell. Our road assistance flat tire costs are affordable and fair, and there is no point for you to do the job yourself. 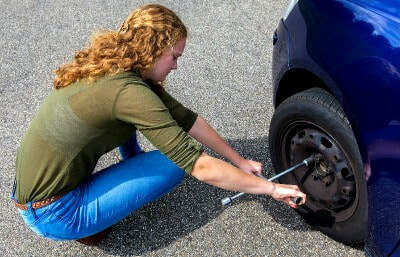 Of course we don’t suggest that everyone needs a towing service technician to change a flat tire, we just say that if you have no idea about what you’re doing, it could be better to find someone who changed at least 1 tire in his/ her life. The starting price for any roadside assistance in Roswell, GA.
​ While a mobile tire service will charge you at least $100 just to come out to your location, plus the cost of the new tire they bring, the starting price for any roadside assistance like roadside tire service at Buzz Towing, starts around $65 or more depending on the location of the vehicle, type of the car and service you need. We don’t provide mobile mechanic or mobile tire service. We only replace, change tires that you have in your possession. We do not sell tires. We are successful because our timely services and affordable flat tire and change emergency service rates. Our drivers are always friendly and professional. We are all about quick and cheap towing and roadside assistance service because we work for the money as hard as you do and we won’t offer you overpriced roadside services. You are nervous enough being in this situation, you don’t need to be nervous about the cost of getting out of it. Calling us you won’t need to wait hours to call us. Many times, a tire can be repaired on the spot or reinflated, so you can avoid replacing your tire, which will be your most expensive option. Hoppefully you have a spare tire in your car and you can use that one until you figure out what caused the flat. If your spare tire is also flat because you haven’t used it for a while a cheap solution would be filling the spare tire with air from a portable air compressor or at a nearest gas station. But few people have an air compressor in their vehicle, but calling our roadside service at 678-916-9021, Buzz Towing will take care of this problem. We have an air compressor in all of our towing trucks and we will fill the spare and replace your flat one so you don’t have to work by yourself on the side of a busy road or a parking lot. Some cars have a usable spare tire but don’t have the proper tools to change it. That’s where we come in. ​ In the worst situation when you end up in a ditch because of a flat tire, needing to be pulled out, our tow trucks will help you get back on the road. We service small trucks and vans, cars and SUV’s. There is no need for a tow service when you have a minor problem so we will not charge you towing rates. 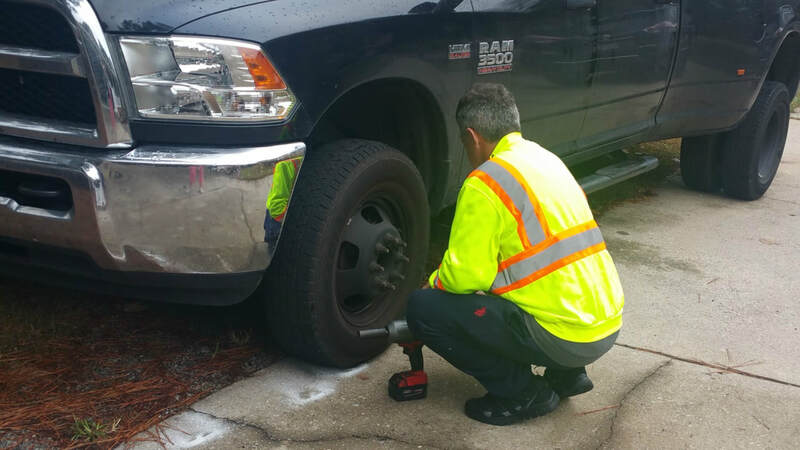 Our flat tire change service is available in Roswell and surrounding areas like Roswell, Alpharetta, Duluth, Sugar Hill, Norcross, Peachtree Corners, Dunwoody, Lilburn and surrounding areas. Our location in Roswell, makes us able to get to almost all the roadside service calls in less than 30 minutes from the time you placed the call, so if you need fast help give us a call right now.